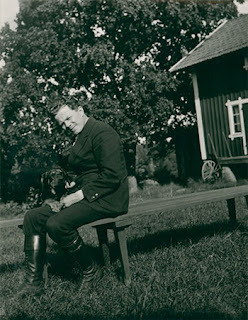 He was a pupil of Thekla Hofer and Torsten Lennartsson in Stockholm. From 1919 to 1921 he studied singing at the opera class of the Royal Opera school in Stockholm. He made his debut in 1921 at the Stockholm Opera as count Almaviva in G. Rossini’s ‘’Il Barbiere di Siviglia’’. In the 1922-1924 seasons he appeared at this opera house and then undertook tours as a concert singer. He travelled around Sweden, Finland, several times the USA (since 1926) and Soviet Union. During the 1930’s he performed at the Stora Theater in Gothenburg and at the Oscar Theater in Stockholm, where he distinguished himself as an operetta singer. At the same time he had a significant career with the Swedish broadcasting company.